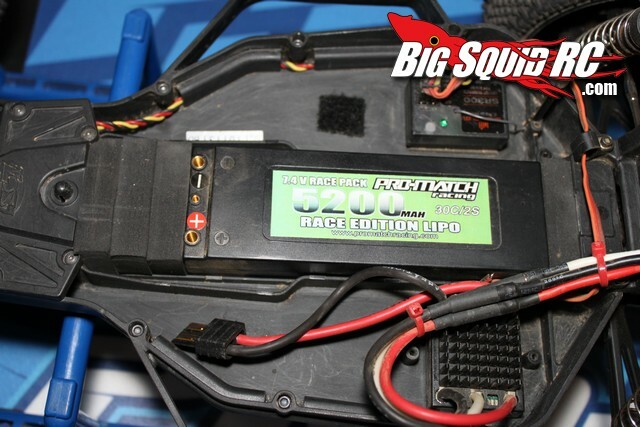 Pro Match Racing 7.4v 30C 5200 Lipo Battery Review « Big Squid RC – RC Car and Truck News, Reviews, Videos, and More! What’s In The Box: Everything you need. 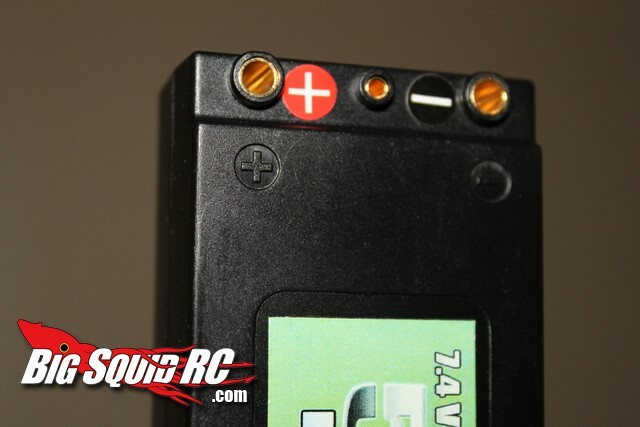 You can get your pack with a variety of connectors, we got the Traxxas “style”. Build Quality: There was an excess of room between the cells and the hard-case, this allows the cells to slide around inside as the pack gets jostled. Driving Impressions: Compared to a cheap 6 cell Ni-mh 2000 mah sport pack, the Pro Match Lipo felt nuclear. The Pro Match instantly gave a vast improvement in power from top to bottom. Wheelies from a dead stop were easier and held longer, big jumps were easily cleared, and top end speed was noticeably improved. Compared to a high end Lipo you could tell the Pro Match was a budget pack. As one tester stated, “It feels like it takes longer to spool up.”. From a dead stop the Pro Match was lacking snap, and on the straights it felt like it wound out early. Of note, it wasn’t like we couldn’t make any obstacles on the track, we could, they were just harder to make compared to when using a higher end Lipo. With that said, the Pro Match had more than enough yank to have fun. It produced enough power to get us over all the jumps at the local tracks and more than enough to leave a massive roost. 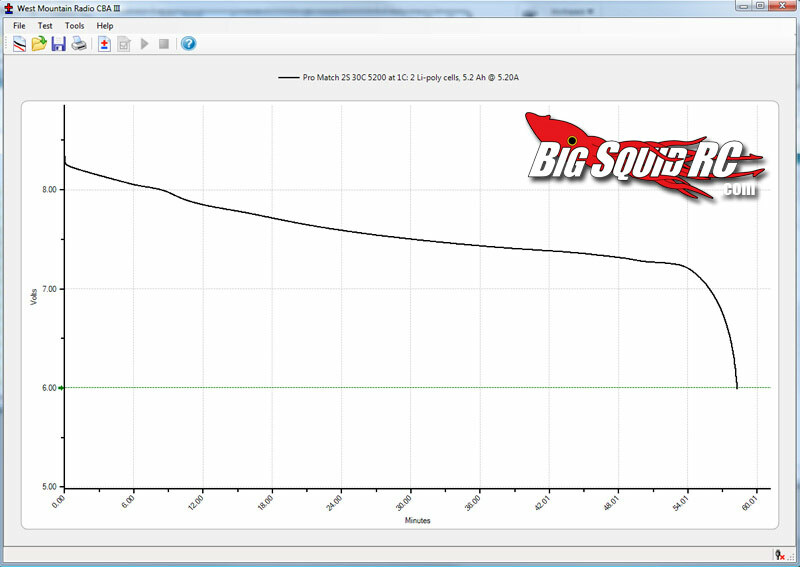 About The Graphs: We used a West Mountain CBA discharger to performed a 1C/5.2 amp discharge to test capacity. Next we did a 30 amp discharge, then a 6C/31.2 amp discharge, and finally a 60 amp continuous discharge to see how well the Pro Match held its voltage under a continuous load. The higher a battery can hold its voltage, the faster your car/truck will be. Ambient temp for all bench tests was 70 F, the pack was always charged on a Hyperion 720iNet3 at 1C/5.2 amps and voltage cut-off was always set at 3.0 volts per cell during discharges. 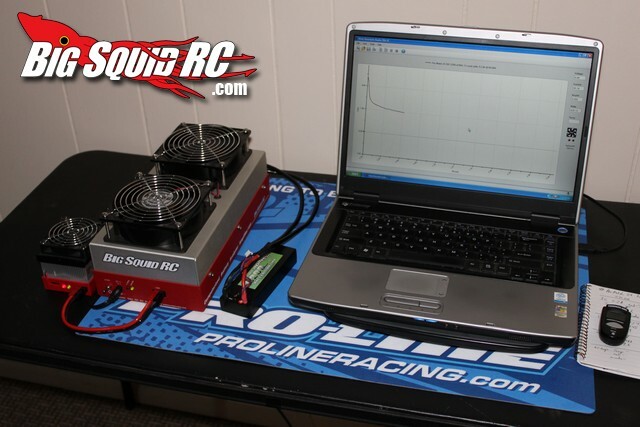 The Pro Match Racing 2S 30C 5200 is a budget pack and it showed on the discharger. 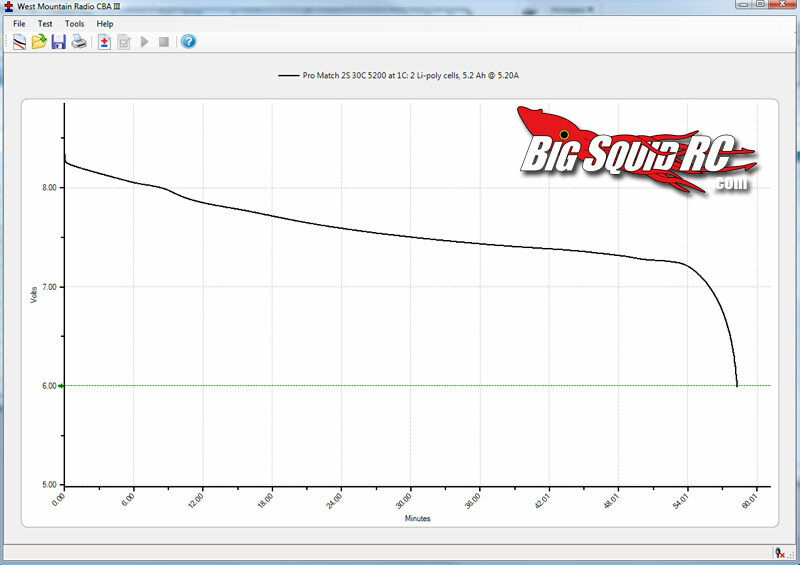 Compared to the Dynamite 2S 50C 5200 Speedpack (which cost more than twice as much and has a higher “C” rating) we reviewed a while back, the Pro Match was down about .2 of a volt across the entire discharge under a 30 amp load, and roughly .1 of a volt under 60 amps. That much of a difference in voltage is easily felt on track. Comparing the curves of the Pro Match against an older Zippy 30C 4000 (costs about half as much and has lower capacity) we reviewed some time ago showed a different story. The Pro Match held about .1 higher voltage across the curve than the Zippy at 30 amps, and held a huge .3 of a volt advantage over the Zippy at 60 amps. 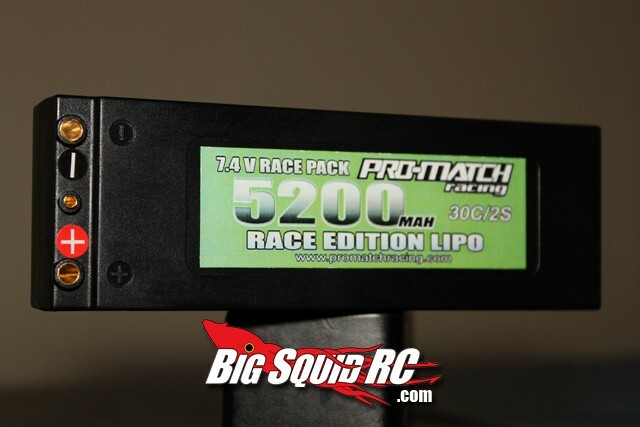 To boil it down, the Pro Match doesn’t compete on bench voltage with higher end packs, but does show higher numbers than some of the lower end Lipo packs on the market. I must note- during the 60 amp discharge the pack temp was 116 degree Fahrenheit, however, at the end of the pack near the bullet connectors we measured 126. The wires and connectors felt warmer than expected, seemingly warmer than on any other pack we’ve tested. We didn’t notice the wires/bullets getting so warm during any of the other tests. 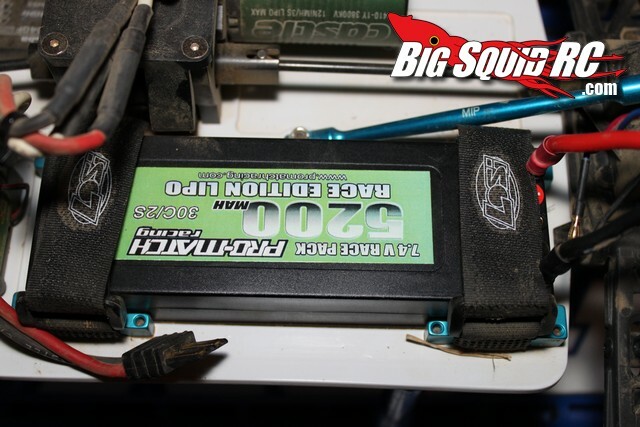 Time To Bash – 9.0/10 -No soldering is needed, charge it up at 2C and hit the track. Car Show Rating – 7.0/10 – Very basic looking pack, although Brian was dig’n the green label. Bash-A-Bility – 10/10 -Our review sample still works fine even after a solid workout on the test bench and over 20 cycles of slamming around on the track and in the backyard. Fun Factor – 7.5/10 -The Pro Match Lipo provided us with many a smile while bashing. Power- 7.5/10 – Better than low end packs, but not on the level of the elite. Value- 8/10 – Decent power for the price point. 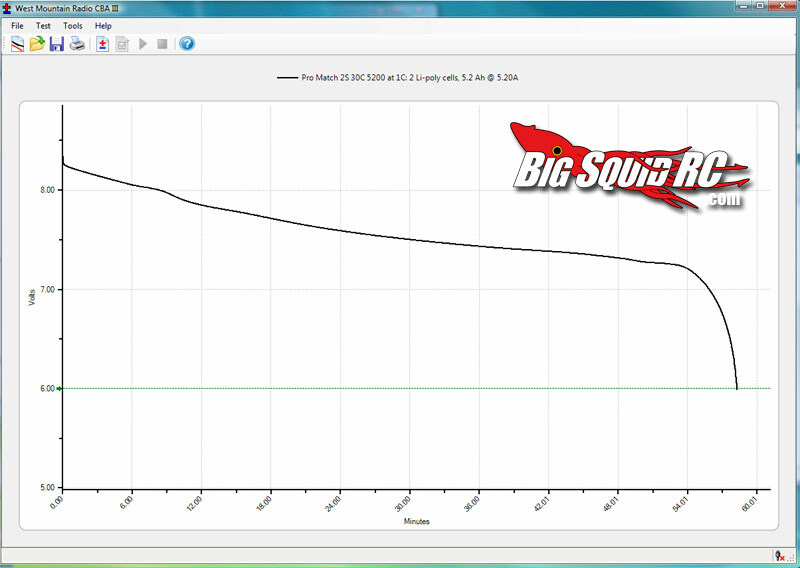 Big Squid Rating – 8.2/10 – Tentacles.. We didn’t have any issues with the Pro Match 2S 30C 5200 and it put out decent power at a reasonable price point.